The small wooden hide sits on the edge of the lake overlooking its troubled water. A strong wind creates small waves and white caps on which hundreds of coot and ducks bob up and down, buffeted by the elements. The surrounding trees sway and bend, their leaves ripped from them, swirling up into the grey sky. Inside the hide it is quieter; its dusty interior smells a little musty and there were cobwebs crammed into every corner and under every bench. The sky through the open windows darkens ominously. 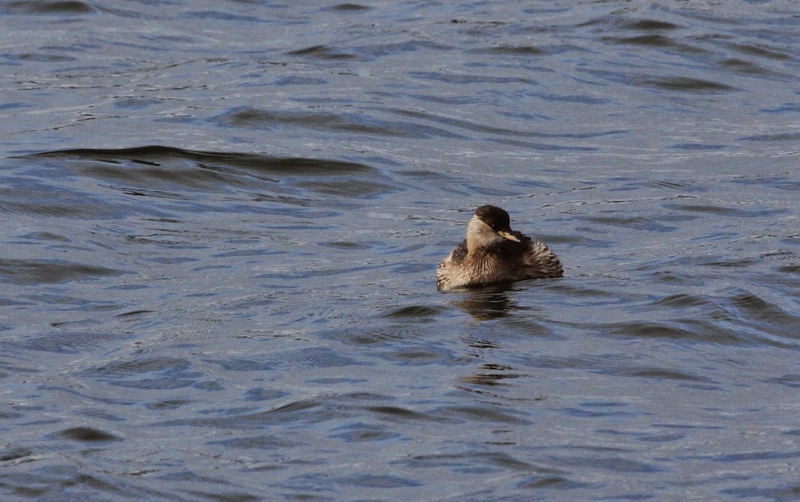 The ducks, coot, grebes and gulls carry on swimming, milling, diving and resting. Slowly at first large heavy rain drops begin to patter on the top of the hide and on the waters surface. Still the ducks, coot, grebes and gulls carry on. The pace of the rain drops picks up. Soon they are pelting down; a torrent of water from the laden sky deluges the birds. It rains so hard the water of the lake bubbles and boils as rain drops bounce back up. Still the birds carry on. Coot bob their heads back and forth, Tufted Ducks and Little Grebes pop up like a bubble breaking on the surface then dive back beneath the waves with a little jump. 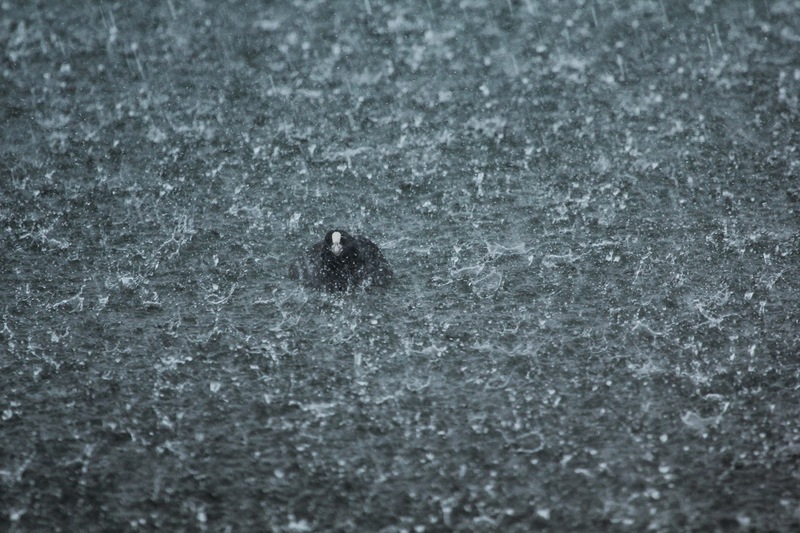 Still the rain pounds the surface of the lake and drums on the roof of the hide. Just in front of the hide a sleek, streamlined bird with dark back and cap, a pale chest and face, and a thin dagger like bill, breaks the surface, appearing seemingly from nowhere. 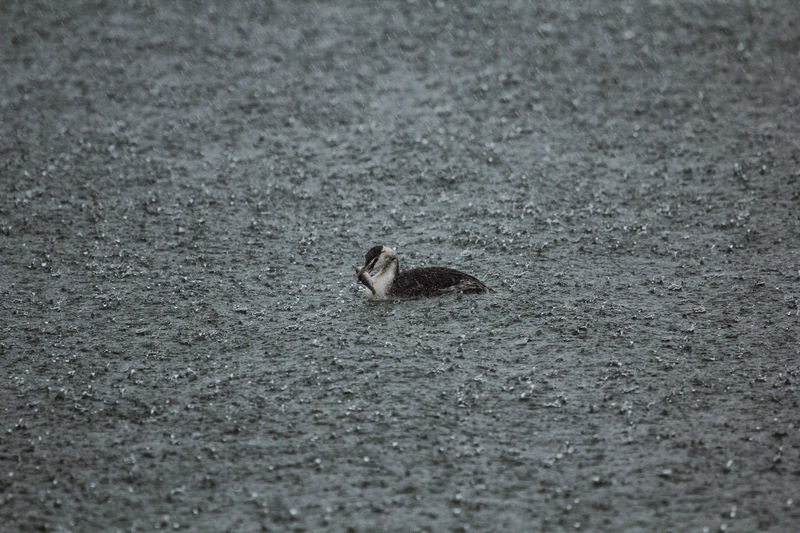 It is a Great Crested Grebe, and as the rain continues to hammer down the bird continues to fish. Time and again it slips beneath the bubbling water, time and again it reappears, shakes its head a little and then continues to look down into the murky shallows, searching. It disappears again, and a moment later reappears with a stocky fish clamped between its bill. The grebe manoeuvres the fish, adjusting its position before lifting its head, stretching its neck and swallowing the fish whole. Another little shake of the head and it is off searching once again. The rain rolls over the lake and its feathered inhabitants like water off a ducks back. For what seems like an age the lake is pounded, its distant shore obscured, the birds along its back edge mere shadows in the mist. Until finally the rain eases, the mist lifts like a curtain and even a small glimmer of sunlight briefly streams through the clouds onto the now calm waters of the lake.